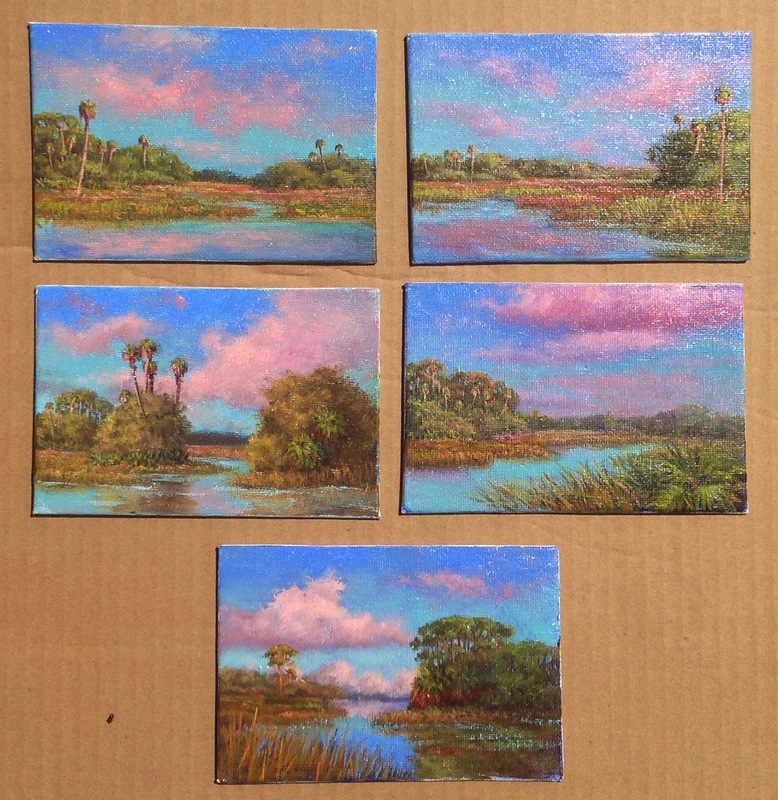 Third Group of Five "Cedar Key Sunset"
This third set of five miniature oil paintings was inspired by a trip I took to Cedar Key. I stayed longer than planned and was treated to a wonderful display of evening color flooding the marsh. If you have not been to Cedar Key on the North West side of Florida put it on your bucket list. This little fishing village is right on the water and filled with quaint shops and restaurants serving fabulous seafood. Number 2, Set of 5 "Cloud Burst"
With all the rain we have been having in Ocala I had to include a rainy day in my Collection of 50 for the law firm. This is Number 2, Set of 5 from that collection. Rainey and foggy days are fun to paint because they are so low key. The chroma must be kept in close range as well as the value. 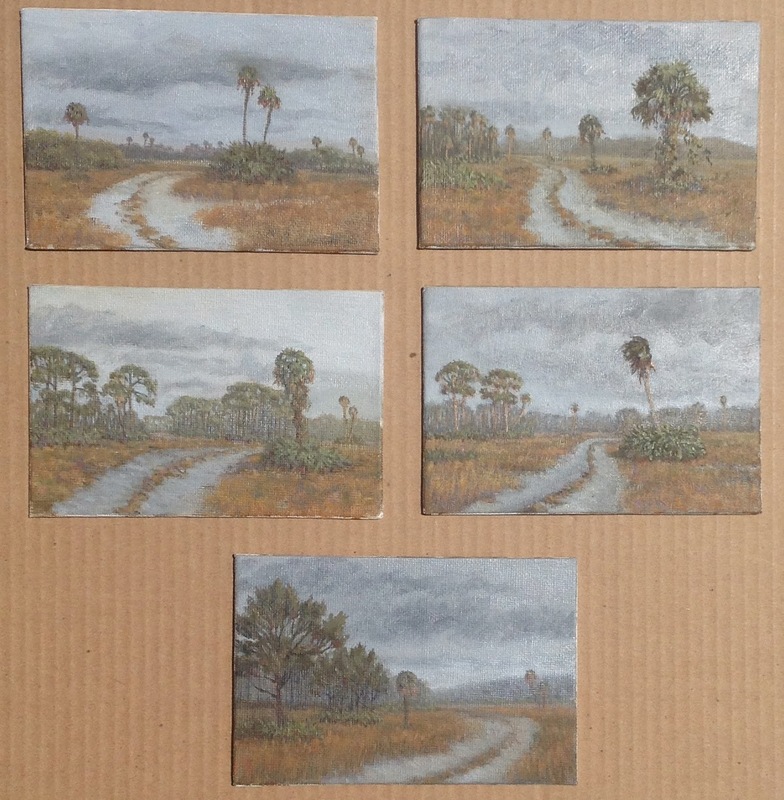 This first set of five original oil paintings from the 50 collection is titled "Everglades Sawgrass". These scenes are indelibly burned into my memory from the many times I drove across Alligator Alley from Miami to Naples and back again. Painting in groups of five allowed me to focus on the type of landscape as a group. I could also use most of the same paint mixtures in each of the five, so I did not have to mix new paint for the next painting, which kept me from wasting paint. And all oil painters know how expensive that can be. It is great to be contacted...totally out of the blue....for a commission. 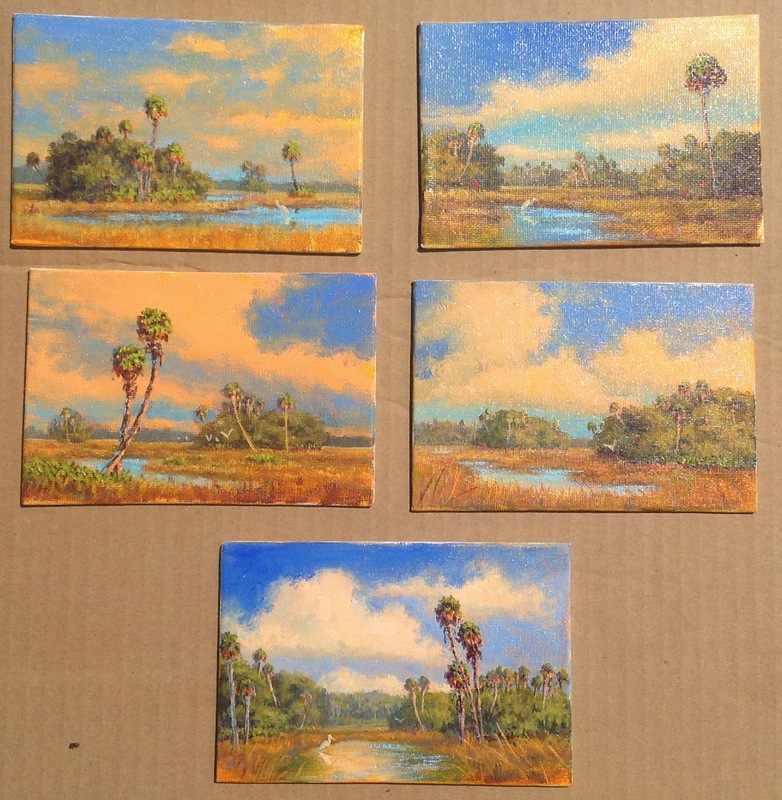 A Miami law firm emailed to say they found my web site, liked my work and commissioned 50 miniature paintings to be given as gifts to their clients. Thank goodness I had a couple of months to work on the collection! No two paintings were to be exactly the same! Even though the paintings are 4"x6" I got drawn into each one as if it was a much larger work so this became a bigger challenge than I anticipated. Painting images were chosen by the Firm from my web site that they wantedwww.jackieschindehette.net represented in the miniature collection. I used the content in those paintings to compose 5 paintings each...no two paintings alike. The above photo is the total collection. 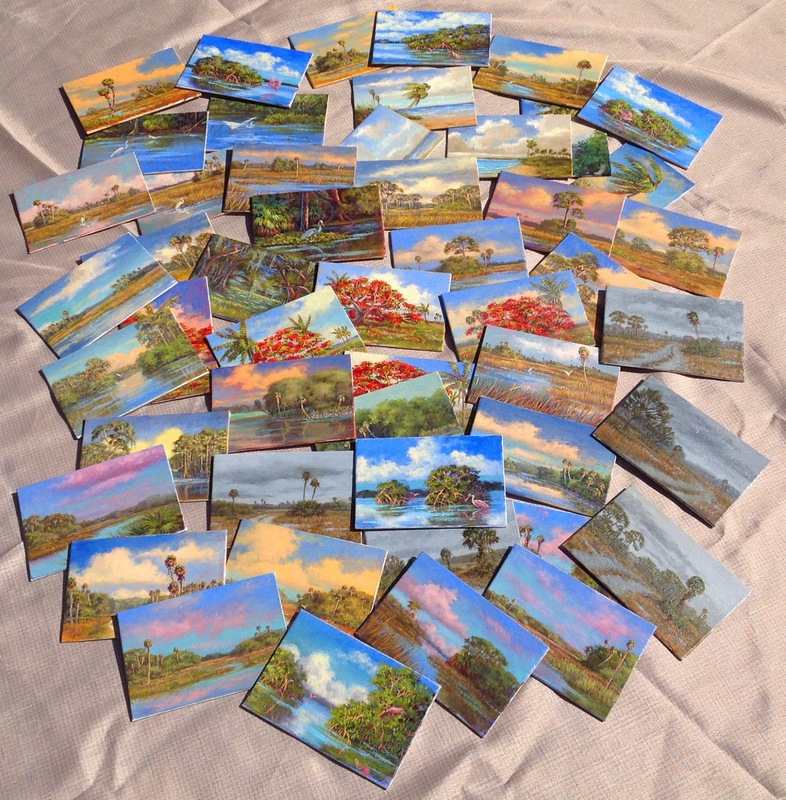 Yep, count them...there are fifty, 4"x6" original oil paintings shown. The Law Firm has received the collection and love the paintings. And I have received my check. Keep watching my blog .... I will be posting all the paintings in their 5 count groups.